If you are going to be reading this weekly blog about Pay Per Click, it is only fair that you get a sense that Brian Newmark knows something about PPC. So here is a bit about my background. I first began developing Pay Per Click campaigns in 2003. This was the very early days of Pay Per Click. I ran large national and geo-target campaigns for the next 7 years on Yahoo and Google. During that time I also focused on other areas of Search Engine Marketing and had numerous stints in Online Reputation Management. For the past couple of years I have been focusing on Reputation Management and have recently again started to develop renewed expertise in PPC and Social Media Advertising. I am loving the evolution and advancements in PPC. Today quality of content both on the ad as well as the landing page is key. This is an area I speak about all the time in the ORM space. So I thought this was the perfect topic for Blog #1. Put in a bid of twenty six cents when others had only bid twenty five, you showed up at the top of the page and people would click your add. Today that is a formula for failure. Quality Scores have come into play as Google has realized that they will get higher click volumes if the quality of the ad is high. While SEO strategies have come a long way, so has Google’s ability to filter out many of them. This is why even the most sophisticated SEO experts still advocate for the use of PPC as part of a complete online marketing strategy. I like this one; it will attract the shopper who doesn’t want to go through the dreaded haggling process. This one not so much, every dealer promises a great deal. Where is the unique value proposition? Nothing here will attract me to click on it. I would expect more from a web only sales site. 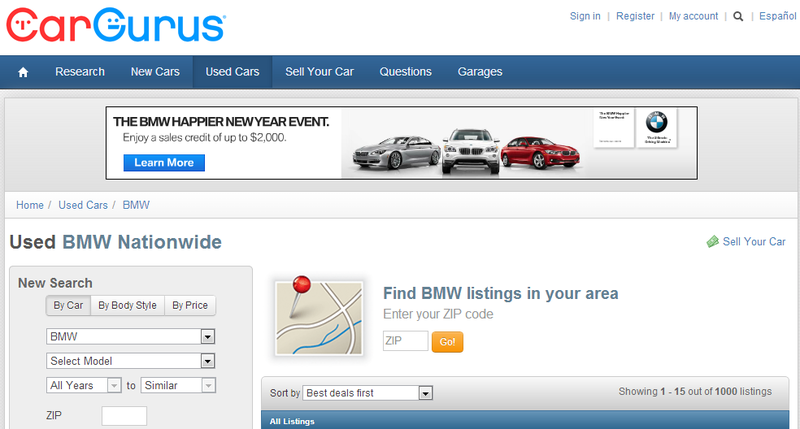 This one gets some points for being a BMW dealer. There is an automatic sense of credibility. This is my favorite and most likely would attract my click, if I looked this far down the page. 25,000 cars caught my eye and Ultimate did as well. Funny the first thing I saw was 25k, it just doesn’t seem like as much as 25,000. 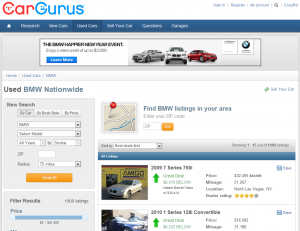 Also, I think since I am searching for BMW’s not cheap BMW’s the Under $10k would steer me away. These comments and opinions were not based on deep insight and study, because ad have 1-2 seconds to attract your attention. For each I tried to take one glance, look away and decide if I would click it or what I remembered. This is a roll I often fulfill for my clients. The problem is the client understand their business, so they assume everyone else does. The reality is 99% of consumers’ process things on a 6th grade level. I try to design most of my campaigns with this in mind. Why did I choose 25,000 over 25k. Simple, everyone knows 25,000 is twenty five thousand. While most know that 25k is twenty five thousand, it does take an extra thought. Why ask consumers to do any extra work. People need something to catch their attention, then instructions as to what to do next. The left hand image is from my laptop. The Right is from my desktop. On my laptop all I saw was “Enter your zip code” Websites are judged by Google based on their bounce rate, yet there is nothing above the screen line that says to me, great sight, I want to keep looking. 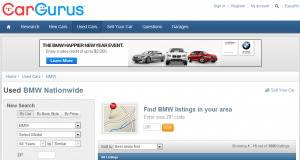 Instead, Cargurus just paid as much as $29.92 (yes, I’m not joking on that one) for me to bounce off the site in a few seconds. How would my experience have been different? At least on my desktop I was able to see some green and the words Great deal… This might get me to keep looking. Unfortunately many people today are searching on mobile devices, so they can’t count on the full screen showing up. I looked at the entire page, which I won’t bore you with, but it reflected 15 BMW’s each showing the savings below Market Value. According to the data provided, with each car I would save an average of $6,806. 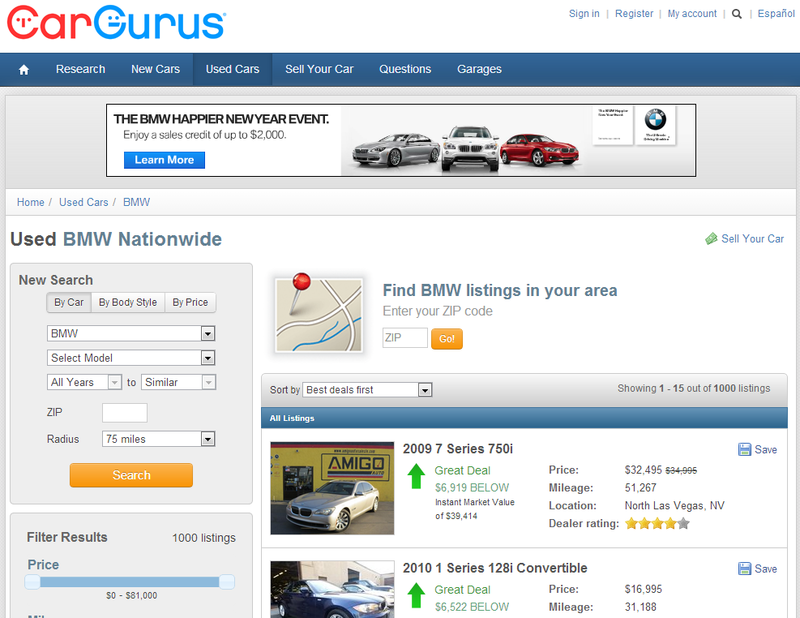 Why isn’t there a header on the top of the page saying “Save an average of $6,806 on BWM’s with CarGurus, scroll down to see for yourself” At very least, I would scroll down to see what they are talking about. I think that online marketing is part art and part science. Unfortunately, sometimes businesses focus too much on the science and forget about the art. They hire a brilliant SEO guy, but forget to involve the marketing and sales guy. I have made an amazing living for 20 years developing marketing strategies for companies. I see things through different eyes than many. Remember your audience and remember to keep it simple. Brian Newmark is a content marketing expert with expertise in reputation and brand management. Newmark's has a tremendous portfolio of International Accounts, with a specific focus in the MENA region. Catering to high profile individuals, multi-national businesses, political figures and governments throughout the world Brian is able to both control what shows up on search results as well as public perception. To accomplish these challenging objective, Brian utilizes high profile media outlets, bloggers, third party sites, as well as cutting edge technology for sentiment and moderation. Brian has 20 years experience in the marketing field with more than 10 years in digital marketing. In that time he has run massive Pay Per Click campaigns, Social Media Campaigns, been a thought leader in Reputation Management, and led the way with thought provoking public perception campaigns. Recently, Brian Newmark has shifted his focus to monetization of high traffic websites. There are so many sites which receive high traffic, but the revenue generation is limited to the core business of the site, often overlooking cross marketing opportunities. In 2014 Brian Newmark co-founded Augment Marketing LLC with his long time associate Timothy Boyd. Together they are bringing new thought leadership to the digital marketplace. With an office in Radnor, Pennsylvania and partnerships in Saudi Arabia and India they are able to tackle nearly any marketing project. Visit their website at http://augment.marketing to learn more. In addition to staying busy in the digital marketing space, Brian is partners in Philadelphia based group of Indian Restaurants operating under the name Tandoor India. This gives Newmark an opportunity to mix his passion for marketing and his love of Indian food. Brian lives in Villanova, Pennsylvania with his wife of 18 years and his two children. In his free time, Brian enjoys travel, automobiles, jogging and time with his family. Share your comment 71 responsesTO Brian Newmark shares his Weekly Pay Per Click Insights. I have been watching Brian Newmark’s insight on various forums for the past year. He has provided great ideas and suggestions. Additionally, he has been very willing to dispense free advice via email – Thank you Brian. Keep the good advice coming! I remember emailing back and forth with you. Very happy to hear that my advice has been helpful. For those who care, Nick owns a small-mid size manufacturing company. A former employee had been harassing them online. I gave him some simple strategies to bolster the company’s own content, which I am guessing made it hard for the attacker’s content to rank. Thank you for the good idea about the landing page. I need to work on some of mine to deal with the screen line issue. I find your post very exciting. Your expertise is apparent from your thought process. There is a lots of insights I am taking away from this post. Your examples, especially CarGurus are quite helpful. You look at Pay Per Click differently than most in the industry. This comment was left in kingged.com -the social bookmarking and content syndication website where this post was shared for Internet marketers. As Brian points out, It is extremely important to realize the difference between what people are seeing on their mobile devices, laptops, tablets etc. vs what they are seeing on their desktops. The difference between what is being seen and what you want to convey is major. This gives some great insight into what companies are actually paying for and what they are really getting. Brian, can you share about your experience when getting into a competitive situation with pay per click ads. What is a race to the top, is really a race to the bottom for budget purposes. More great content from Brian Newmark about Pay Per Click Thank you so much for sharing your insight. I know you are an expert in world wide brand and reputation management, can you post some content about those topics. Great advice Brian Newmark, I am going to change up the PPC I am doing for my company. Thank you Brian Newmark. Great insight into pay per click! This article was very informative. Thanks Brian Newmark, great insight into PPC. you have really great insight! Brian Newmark is a great help with seo,marketing,advertising and ppc.I would like to hear a lot more to what he has to say. This article is very helpful. I found a number of tips an good advice from Brian Newmark. Thank you for taking time to gather valuable information. Thanks Brian Newmark.. This is great insight into PPC. Thanks Brian Newmark, great advertising! Thanks for another knowledgeable article Brian Newmark. Learned something new from you again. I’m new to Pay Per Click and still researching more about it and articles like this really helps me, thanks again. Some interesting points there, definitely worth thinking about. I’ll be following these blogposts from Brian Newmark closely in the future. Thanks for sharing this information, it is very helpful. Brian Newmark is one of the best in the SEO business. More great content from Brian Newmark about Pay Per Click Thank you so much for sharing your insight. Thanks to Brian Newmark, excellent marketing ideas. great landing page!.. very great insight! can i get your email brian newmark? hoping for more post!! Thanks Brian Newmark, great insight into PTC. Great tips on PPC as usual Brian Newmark. Your explanation of online marketing as both art and science is truly inspired. Very good, interesting information. Thanks, Brian Newmark, for the tips! Thanks Brian Newmark for the detailed tips and insight on marketing and PR. This was really great information! Thanks Brian Newmark. A lot of people appreciate your wise knowledge. This is very informative and well described. It’s easy to understand all the points being made by Brian Newmark. I enjoyed it a lot and will share what I learned with all my friends. Hey Brian Newmark! Great rundown of the pitfalls and strengths of PPC ads. You always offer great marketing tips. Brian Newmark always knows the right way to explain everything concerning PPC. I have read so many articles about it online but never fully understood it. Thank you. Brian Newmark definitely knows what he’s talking about when it comes to PPC. He’s probably the most informative supplier of information on the topic. It seems that brian Newmark really knows his stuff. Thanks Brian Newmark, great insight into PPC. Thank you Brian Newmark. Very informative with some great ideas and suggestions. Thanks Brian Newmark for all of the insight and tips that you’ve provided. It has really helped me and directed me on the correct path. Thanks Brian Newmark, great insight into SEO and the benefits it has on an expanding business. This article was very helpful. I have been trying to get things moving in the right direction with my social media company, but my current campaign has produced few results. Thanks for a push in the right direction. Thanks Brian Newmark, great insight into Pay Per Click. I have really learned a lot from your experiences. Thank you Brian Newmark, i recently read your article and i love the advice you have for people on PPC ads. Hey Brian Newmark, I am very surprised to see this article. It has everything about Pay Per Click program and this is exactly what I’m looking for. Thank you so much. Thanks Brian Newmark, great insight into. It helped me a lot and will help me more in the future! I too have been doing PPC for years. You’re kind of an old time in this space 🙂 Keep going. Thanks Brian Newmark, great insight into marketing! I am launching a clothing line, do you think this works for a new brand? Absolutely. While many of my clients are well established brands, I love start ups. Give me a call. Brian Newmark, where have you been. Being a click worker, I often what goal we are achieving by our work. You are enlightening. I am looking forward to reading more blogs from you in the future. Thanks for explaining in terms I can easily understand.. Thanks so much Brian Newmark, I have learned so much after reading your info. Brian Newmark is a great man. Nice insight! Hats off to Brian Newmark. You are a life saver!! More excellent information from Brian Newmark. Once again I have found it extremely helpful. brian newmark is so good at marketing! The results speak for themselves! Hi There Brian. Thank you for your insight on PPC as it was then. Obviously SEO and PPC tactics has changed ever since your posting. Have you found the results the same as it was or more simplified as you suggested? Thanks Brian Newmark! Great information and insight. Thanks Brian Newmark, for sharing this great insight into SEO and PPC. Hopefully it will help in building PPC campaigns. I’ve been trying to grow my Facebook profile so I can use it to promote my company, but have not had any luck. I’m going to give this a try. Thanks Brian Newmark, great insight into marketing. I learned a lot from reading this. Thanks so much Brian Newmark, for this very educational blog! I see what I am doing wrong now… thanks again! Thanks, Brian Newmark, for a job well done! Wow, thanks to Brian Newmark I have more insight and information on PPC. Thanks for the help! Thanks Brian Newmark, great insight into how PPC have changed and evolved with SEO and Social Media. Factor in how most people now pull up websites–or try to–with cell phones and you definitely need a different strategy than say 7 or 8 years ago. I think also Google Panda has changed some of the rules too for PPC. Thanks Brian for the information that you gave on marketing ideas, I will definitely be using this information in the future to help drive traffic to my new website. More thanks for Brian for the information that you gave on marketing information, I will confidently be using this information in the future to help drive traffic to my new website.